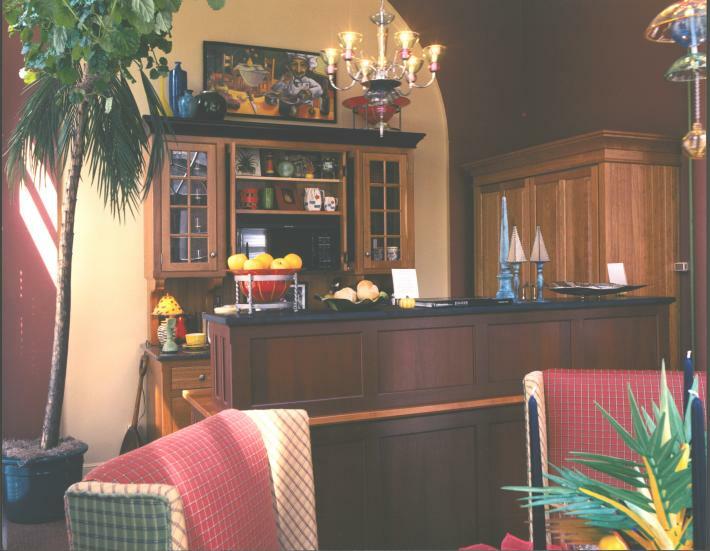 This award-winning kitchen composed of only three super-efficient workstations was designed by an Indianapolis kitchen dealer, Mike Teipen of Kitchens by Teipen. The room is a converted solarium in a show home mansion whose loft-like proportions were a great match for our unfitted workstations. The 3 piece ensemble would head to Mike’s showroom after the Show House exhibition closed, so Mike wanted each piece to display as many styling options as possible. Note the various side and back paneling/finishes, crown moldings, stain colors, counter top materials and door styles. Having this much variety in a similarly sized standard kitchen composed continuous cabinetry and counter tops and exposed appliances is virtually impossible. This variety was one of the main reasons this award-winning kitchen was so honored. In the foreground is a freestanding (S) sink workstation in Bombay mahogany with a cherry counter top and an (ST) storage unit above with a slate worktop. The range (B & TP-tall) safely conceals a microwave hood and an oven and is made of cherry with a natural finish and has a Copper Mine granite counter top. The black panels (that match the black slate on the ST unit) in the doors are made of perforated aluminum which allows the doors to breathe when they conceal the appliances after they are done cooking. And the natural cherry (SZ) unit features a Subzero 700 refrigerator/freezer with a matching side full height pantry that fills the need that typical wall hung provide. Next ArticleDesigner’s Show House Kitchen moves three times!